You guys are loving my 2-ingredient cheesecake (my take on bhapa doi) and I couldn’t be happier about it! I love seeing all of the cheesecake photos you all share! Some of you have asked me to create a video of me making my cheesecake recipe – so I went ahead and recorded one! Check out the video below and read the FAQ I’ve put together below as well. If you still have questions, leave a comment and I’ll update the post! Does this really taste like cheesecake? What size pan can I use? You can use any oven-safe container to make this cheesecake but the size of the dish may adjust the cook time. For the cheesecake pans, I do 30 minutes with a 20 minute NPR and for the 6 ounce ramekins I do 25 minutes with a 20 minute NPR. I would NOT suggest using a spring-form pan as those can leak. Can I add a crust? If you are using a cheesecake pan then yes, you can definitely add a crust! Just grease the pan well, add the crust and pour the cheesecake batter on top of the crust. If you’re using ramekins then it may be tough to unmold the cheesecake with a crust, but you can try! I have not tried it this way though. If you’re making a plain cheesecake, you can use any whole milk (full-fat) yogurt. 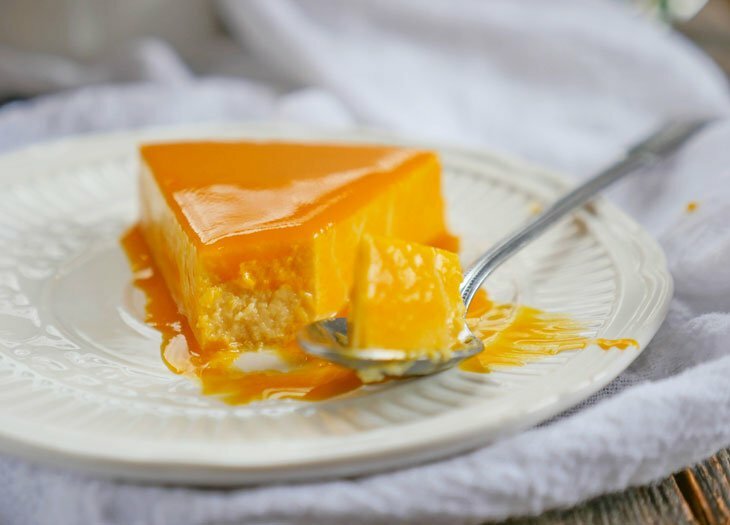 If you’re adding a puree (like in my mango cheesecake recipe) then I suggest using whole milk greek yogurt rather than regular whole milk yogurt because greek is thicker. If you have regular whole milk yogurt then you can use a sieve to separate some of the whey from the yogurt before measuring. I want to use non-fat or low-fat yogurt, can I do this? I haven’t tried it myself (I always buy everything full-fat) but many others have said that low-fat and non-fat yogurt have worked for them. If the yogurt looks too thin, strain it to remove some of the whey. This will result in a thicker yogurt (also called hung yogurt) which works better in this dessert. Can I use flavored yogurt? Yes, as long as it’s full-fat it will work 🙂 People have made this cheesecake using all types of flavored yogurt! Have fun with the recipe! You can try adding vanilla or cardamom or a fruit puree (strawberry, pineapple, banana, etc) or top it with some kind of jam or glaze. I have seen people in my facebook group come up with such creative flavors (including thandai, oreo, rose, saffron and more)! I will be updating this as I share more flavors! Can you freeze the cheesecake? Why is my cheesecake watery? This cheesecake sometimes releases a bit of whey after being cooked, just drain it out and enjoy! If it’s too watery, then try straining the yogurt next time as it may have been too thin. Now if your cheesecake is TOO watery then you may not have properly covered the top with foil – covering the cheesecake well is very important. If too much water from steam gets into the cake, it won’t set and it also won’t look very pretty. Yes! 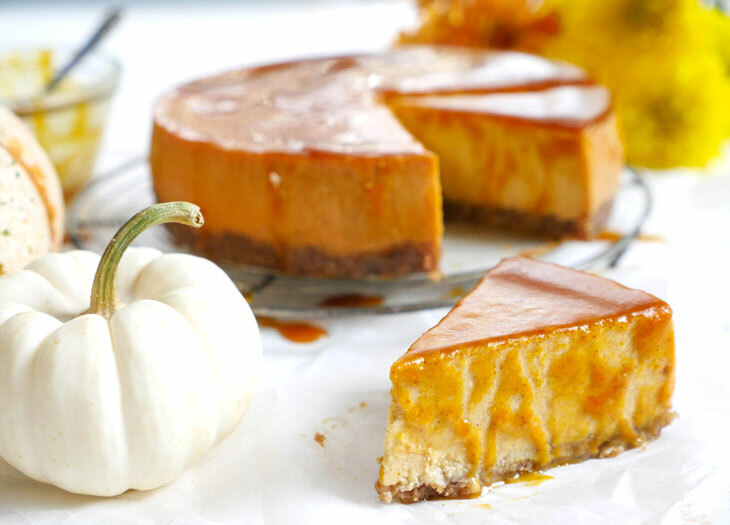 You can make this in an oven using the bain-marie method (cook the cheesecake in a water bath by placing the cheesecake pan into a larger pan with water). Some people in my facebook group have successfully made it by baking at 350F for 30 minutes – I have yet to try it this way (the IP is just so easy for me) but I will update this with my results as soon as I do! How can I reduce the amount of sugar in the recipe? I have heard from people who have used evaporated milk instead of condensed milk and have had success in making a sugar-free cheesecake (update: I recently tried an all evaporated milk cheesecake and it did not turn out well for me… ). I have heard from people who made their own condensed milk and said it turned out well. I have also heard from people who used a combination of condensed milk and regular milk to reduce the amount of condensed milk and said it turned out well. I have only tested the recipes as written but it seems like this is a surprisingly forgiving recipe. Unfortunately, I have not been able to make this dairy-free. I have tried making this with condensed coconut milk and it did NOT work out for me, so save your money folks. I will continue to test recipes and hope to come up with something soon! Pls tell how much quantities. what is the solution for spring form pan..? I think there are some people who have used it successfully but it has leaked for others. You can try lining it with parchment paper but I’d suggest using another IP/oven-safe container if possible. Yes. You have to wrap the whole bottom and sides of pan in foil, then firmly place foil over the top. This seals the seam and prevents leaks. It’s really important to make sure that it’s not calorie reduced yogourt or one that contains gelatine because they don’t work. I found Greek yogourt works best. Good to know, thank you Edith! I don’t have a cheese cake pan. Can I use any pan? Will it come out without breakage? Hi Ashley yesterday night I just made and it’s came out perfect. I have a question can we cook in pressure cooker bcoz my sis is also interested but she don’t have instant pot. Aww thank you! I love your blog and sharing your recipes with my family! My husband and I finished off the last lemon cheesecake ramekin yesterday, and we topped it with some raspberries, which we really enjoyed. I wonder, can you make this cheesecake with raspberries? If we smash up the raspberries and mix with the condensed milk and yogurt, would the consistency still be ok? I don’t have an Instant Pot. What is the alternative for it? Will rice cooker work (on steam mode)? Will the cooking time remains the same as Instant Pot? My three year old grandson and I made your two ingredient cheesecake tonight, and added five more ingredients: about 2 tsp Mexican vanilla extract, about a tsp dried grated orange peel, a handful of golden raisins, and a few TBS pistachio nuts (minus shells of course) plus a few whole cardamom pods, whirled around together in the food processor to make a coarse grind. We used a silicone mold that had fairly small depressions (maybe 1/4 c each? ), 18 mins high pressure and 20 minutes natural release, then another 15 or so mins in the fridge before unmolding. It was delicious. The three-year-old and his four-year-old brother and I loved it and had seconds, though my 26 year old daughter said she didn’t like “things” in her cheesecake and my son-in-law doesn’t like raisins. I wanted this to work and I messed it up…I used homemade whole milk yogurt but used 6 – 4 oz. ramekins for 25 min. and 20 min. natural release. How much time do you think because mine were tough and the color was tan ??? Weird! Thanks for any help. Do you have the recipe for making a basic graham cracker crust? Or even suggestions on other types of crust for the mango cheesecake? Roopa, I’ll work on creating some simple crusts – some people just use crushed cookies and butter. If you are in my Instant Pot for Indian Food facebook group – a lot of people share have shared crust ideas in there! I followed the recipe exactly as well as the pressure settings & times. The 2-Ingredients Cheesecake was delicious, but have a question. I used a 6inch springform pan, after cooking was done and removing cheesecake from pan noticed the height was about 3/4 inches tall. However, looking at the pictures you have the cheesecake appears to taller. I did use the full Greek Yogurt, but added a little more as I felt there was not enough Yogurt in the mixture. Is it i cup or 1 tub of Yogurt? Any ideas as why the cheesecake was only about 3/4 inches tall. I used a ruler to measure it. Hi Bill, glad you liked it! 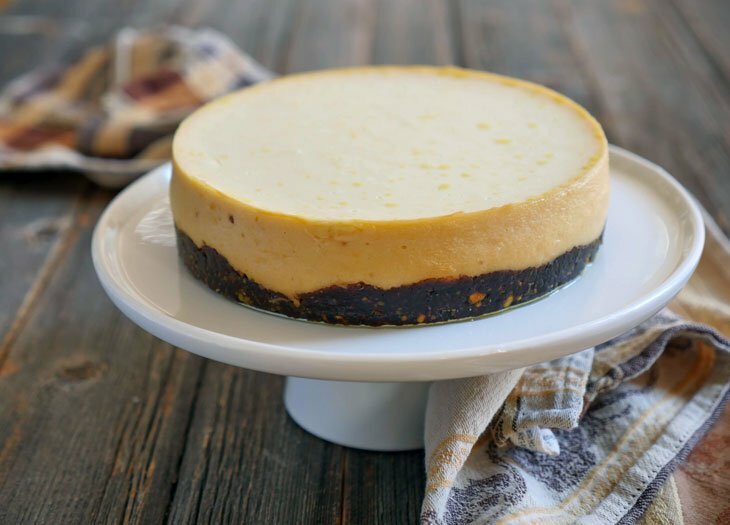 As for the height – it depends on the size of your pan – ramekins will make taller cheesecakes. 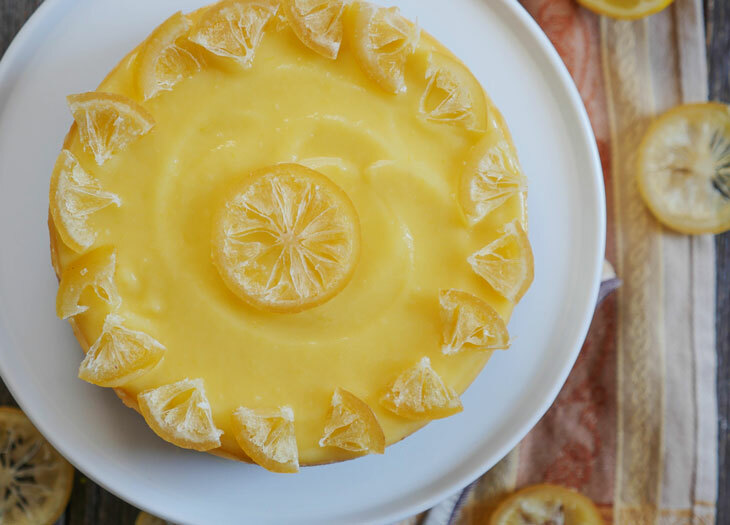 If you’re using a cheesecake pan then adding a crust will also increase the height (like in this lemon cheesecake recipe). 1 cup of yogurt is right – I’ve heard from others who have used more yogurt to help make the cheesecake less sweet but I haven’t tried it myself – though I’m sure it would also help add height. Hope that helps! I love the recipes you post and I have made a few but I do have a question. I have an Instant Pot but do not quite understand how it works. Like you say for the Cheesecake recipe, to let it steam vent naturally for 20 minutes ??? ?Exactly how is this done? Ashley, if i need to make 4 times the qty in your recepie, how should i do it? Can i pour it in instapot directly and then move to another container to freeze it? Or should i do it 4 times? I haven’t tried quadrupling the recipe but I have heard from others who were able to successfully double it. Maybe try doubling it first? You can also posting this question in my “Instant Pot for Indian Food” facebook group – someone there may have tried this and be able to help! HaHa I meant can I use digestive biscuit as a base at the bottom of the cake pan, anyways ,made twice already. i was thinking this time to add pistachio powder ( I got on my visit to Iran) the digestive crushed biscuits. Umm I was super skeptical and ran to the store to buy a 6 inch spring form. This was super easy and I had to give it a try before I shared it with the family just in case it was gross. I took one bite and ran to the living room with forks and plates! I did not tell them what the ingredients were before the first bite. It was DELICIOUS! As I am writing this I have a lemon cheese cake in the IP! Major score!!!!! Brad, yay!!! I’m so happy to hear that you tried this despite being skeptical lol and even happier that you liked it so much 🙂 Thanks for letting me know how it turned out!! Hi !! This sounds exciting. I am new to IP and would love to try this cheesecake ! Can I use almonds instead or pecans ? Thanks ! I have made this a number of time an really enjoyed it. I have use a 6″ french casserole dish and now have an 8″ spring form pan. Can I double the recepie ( I want it to be thicker). If I double, should I adjust the cooking times? I’m so glad you like the cheesecake recipe!! I haven’t tried it this way – hopefully someone who has can chime in! What about making the crustless version in a steel tiffin box? I have a tiffin carrier about 5.5 inches in diameter and a standalone tiffin box about 7.5 inches diameter. Thoughts on which of these might work better?